Reported by Ahmad with an acceptable chain of narration. Ibn Hibbaan and al-Haakim authenticated it, and adh-Dhahabee agreed. 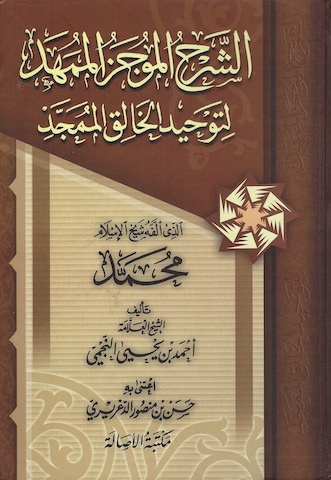 And similar to this has also been narrated by Abu ‘Aamir Kharaaz from al-Hasan. [Reported by Ahmad in his Musnad, 4/445, no. 20014. Ibn Hibbaan in his Saheeh, 13/449, no. 6058, Chapter: ar-Ruqaa. Al-Haakim in al-Mustadrak, 4/216. Ibn Maajah in as-Sunan2/1167, no. 3531, Chapter: Hanging of Amulets. At-Tabaraanee in al-Mu’jam al-Kabeer 8/67, no. 7700, 18/179, no. 391. Ibn Abee Shaibah, 5/35, no. 23460. Musannaf Abdur-Razzaaq 11/209, no. 20344. Whoever hangs an amulet (a charm or taweez), may Allaah not fulfil for him what he desires from it. And whoever hangs a sea shell may Allaah not give him ease and tranquility. Whoever hangs an amulet has committed an act of polytheism. 1. A severe forbiddance of wearing a ring, string and so on for these purposes. 3. That one is not excused due to ignorance. Ignorance for which a person is excused, and ignorance for which a person has no excuse. So the one who himself falls short and is neglectful whilst being able to seek knowledge. This one is not excused, regardless of whether it is in an affair of Kufr or sin. And as for the one who is opposite to this, i.e. he is not negligent and does not fall short but he is not capable in seeking knolwedge and it does not occur to him that this affair is something forbidden, then such a one is excused. So if he is one who ascribed himself to Islaam, then that ignorance does not harm his Islaam. If he is a disbeliever (not a Muslim), then he is a Kaafir in this world, however in the Hereafter, his affair is left to Allaah in accordance to most correct saying of the scholars. He will be tested in the Hereafter, and if he obeys, he will enter Paradise, and if he disobeys, he will enter the Fire. So upon this, the one who was raised in the far off desolate desert areas where there are no scholars and it does not occur to him that such-and-such an affair is forbidden, or such-and-such an affair is an obligation, then such a person is excused. And there are examples for this. A person who is young and he lives in the far off desert areas, and there is no scholar there with him, and he has not heard anything from knowledge. He thinks that a person is not obligated with acts of worship until he reaches the age of fifteen. So he proceeds, [even though he has attained puberty before fifteen], until he actually reached the age of fifteen without fasting, praying, and without purifying himself from sexual impurity (janaabah). This individual is not commanded to make up what he has missed because he is excused for his ignorance which is not connected to any negligence in seeking knowledge and it did not occur to him that it was wrong. 5. A severe rebuke upon the one who wears an amulet. 6. A clear statement that the one who hangs [or wears] an amulet it entrusted to it. 7. A clear declaration that the one who hangs [or wears] an amulet has committed Shirk. 8. That hanging [or tying] a thread as a prevention from fever is Shirk. 9. Hudhayfah’s (radiyallaahu ‘anhu) recitation of the verse is a proof that the Companions would utilise the verses that mention Major Shirk as proof also against Minor Shirk just as Ibn ‘Abbaas mentioned concerning the verse in al-Baqarah (2:165). This verse refers to Major Shirk, however the Companions would utilise these verses also in cases of Minor Shirk, and this is because Minor Shirk is in reality Shirk even though it does not exit the person from the Religion. For reason we say: Shirk is of two types: Major and Minor. 10. That the hanging a seashell for protection from evil-eye is also from this category (i.e. Shirk). “Ar-Raf’u” is to seek that a calamity is “lifted” after it occurs. “Ad-daf’u” is to seek that a calamity is “repelled” before it occurs. This is as some of the people believe that there are affairs that repel (or ward off) the evil-eye or Jinn or what is similar to that. This is a dangerous matter. So someone may have built a house, for example, and it is said to him: “If you want that the Jinn do not harm you in your house, then spill blood for the Jinn so that they do not harm you.” So he believes this, and spills this blood in his house for the Jinn, even if it be the blood of a small bird or cockerel (or hen), and he spills it to please the Jinn or the people; as occurred amongst a people who lived before us. They had idols, and they were settled upon a path which the people would pass, and they agreed that none would pass by until he has performed an act of worship seeking nearness to their idol. And whoever sought nearness to the idol, even by the sacrifice of a fly, they would let him pass – and if he refused to offer any act of worship to the idol, they would kill him. Then there passed by them two men, so one of them conceded and offered his worship, so he was saved from death, but Hellfire was obligated upon him as a recompense for his deed. As for the other person, he was not willing to sacrifice to anything other than Allaah, so they struck his neck and killed him, and he was admitted into Paradise. The meaning of this verse: Say to them, O Muhammad: “Have you considered?” O polytheists, “what you call upon besides Allaah,” meaning: That which you call upon besides Allaah from the things you worship such as al-Laat, al-‘Uzzaa, and al-Manaat and other than them, “If Allah intended me harm,” meaning harm that afflicts me, then are these gods able to remove it from me? This hadeeth encompasses the following: That the one who wears an amulet, then he entrusts himself to that amulet, regardless if it is made from brass, iron, or a thread or a string, or a belt or other than that. These things do not benefit the ones who wear them whatsoever. The believer trusts in Allaah and relies upon Him, so the believer is connected to His Lord (subhaanallaahu wa ta’aalaa), without turning to anyone besides Him. And this is the Tawheed without which Allaah does not accept the worship of the servant, whether it be Salaah or Fasting or other than that – these deeds are not accepted except with presence of Tawheed, because it is the foundation and the fundamental principle. Whoever hangs an amulet (a charm), may Allaah not fulfil for him what he desires from it. And whoever hangs a sea shell may Allaah not give him ease and tranquility. The narrater is ‘Uqbah b. ‘Aamir b. ‘Amr al-Juhanee (radiyallaahu ‘anhu), a well known and noble Companion. A group of Companions and Taabi’een narrate from him. He is from those who gathered the Qur’aan. His (salallaahu ‘alahi wassallam) saying: “Whoever wears an amulet.” Meaning: That he wears or puts it someone else such as a child or a riding beast whilst his heart is reliant upon it in seeking good or warding off evil, then: “May Allaah not fulfil [that need] for him.” Meaning: May Allaah not fulfil for him his objective, a supplication against him in opposition to his objective, and that Allaah not fulfil his affair. The supplication of Allaah’s Messenger (salallaahu ‘alaihi wassallam) against the one who wears an amulet proves that it is forbidden – and its forbiddance proves that it is from the prohibited acts of polytheism – and that was considered as Shirk. When the heart becomes attached and becomes dependent upon other the Allaah in seeking to attain benefit or repel harm, then the completion of Tawheed will not be attained except if these things are abandoned. I say: We know from what has preceded that some people hang amulets on themselves or upon their child – and his heart is attached to this amulet believing that it can avert evil and harm. How many people have we seen who are attached to these amulets? And were you to try and remove the amulet from him, he thinks that you throwing him to his death! Some people hang amulets upon their beasts claiming that it will ward off the evil-eye and Jinn. In previous times, the circumcised would carry a blade or knife, and they would claim that this metal which he carries will protect him from the devils! And likewise the post-natally bleeding would carry a knife (particular knife used in Jaazaan for cutting crop) claiming that it would protect her child from the devils; and some people would hang a eagle’s bone; yet others would hang some part of a hyena; others would wear an eye of a wolf. Upon a handsome camel they would hang seven twigs of a tree that grows in their regions. Many things that the Shaytaan has invented for the people, so that the hearts become attached and reliant upon these things, believing that they will safeguard a person. Furthermore, sea shells, threads and strings are worn for the same purpose. All of it is impermissible for a Muslim to engage in because it is an attachment and reliance upon other than Allaah. So, in general, whoever wears a thing claiming it will bring about benefit and in itself will ward off evil and harm, then in this case such a person is considered to have committed Major Shirk with Allaah, or at the very least Minor Shirk. For this reason a person is not free of one of two beliefs: If he believes that his wealth and well-being stops at this object that he is wearing so that if it is cut off and removed from him, he believes that destruction will befall him, then that is considered as Major Shirk. If, however, he believes that the amulet is a reason or a means, alongside affirming that Allaah is The Healer and The Protector, then such a person has fallen into Minor Shirk, and Allaah knows best. Al-Wada’ is a shell that comes out of the sea. Some of the poor people use these shells for beautification and the children play with them. However, it is considered to be Shirk if the shell is worn believing that is repels the evil-eye or the devils. As for wearing the shell for the purpose of beautification as it is done by the womenfolk of the mountain areas, then that is not considered to be Shirk, and does not even enter into Shirk. As for the saying of the Prophet (salallaahu ‘alaihi wassallam) regarding the one who wears an amulet: “May Allaah not give him tranquility,” this means: Allaah will not leave him be – rather He will hasten his punishment. That is what is apparent from the meaning. The saying “tied to his hand there was a string to protect him from fever.” People in olden times would take a string or thread, recite over it a portion of the Qur’aan as a Ruqyah (divine incantation) and tie it – and they may sometimes recite something other than the Qur’aan, and then wrap around seven times. They would then say: “This will protect against illness, fever and its likes.” And the people of the past would do such things. Cutting off the charm or the string or any other amulet without advising the one wearing it and satisfying him that it will not benefit him in the least, nor defend him or protect him from harm, and nor will its wearing bring any benefit is not to be done except by the one in authority. So the Prophet (salallaahu ‘alaihi wassallam) cast off that ring from the man regardless whether one is pleased or not because the Prophet (salallaahu ‘alaihi wassallam) was in authority. Likewise Hudhayfah (radiyallaahu ‘anhu) was the Ameer of those townships in that time. So what occurred from Hudhayfah was due to him being in authority just as the Prophet (salallaahu ‘alaihi wassallam) was in authority and he was a legislator. So it is not permitted to use these two incidents and thus go around cutting amulets from whoever we see wearing them whether the wearer is pleased or not pleased. This is an error. Rather the preventing of evil with the hand is for those in authority, or for a man in authority over his household. As for other than physical prevention, then it is prescribed for a person to forbid such evil by guiding and directing and sufficing with proofs. And if the wearer is satisfied then the amulet should be cut off, otherwise no. And cutting off amulets by a person without the authority of the ruler could lead to dissension. So the Lawmaker (Allaah) specified that the forbidding of evil with ones hand physically is for the ruler or the one he has appointed or the one in charge of his household.